If you use a Mac Mini with a paired Apple Remote, you may experience issues with your remote’s buttons not working at random times. There is a known issue with Google Chrome using the Mac Mini IR receiver while Google Chrome is open. This appears to cause confusion with the Apple IR receiver understanding which device or application to process commands from. 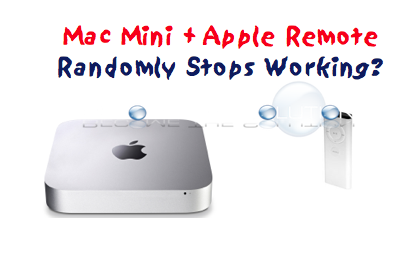 When this occurs, you may be able to use your Apple remote on and off with your Mac Mini, however; sometimes the remote will not work at all, even after you quit Google Chrome. You can check if Google Chrome is using the IR Receiver by downloading Remote Control Diagnostics here. An application is accessing the IR Receiver USB device via an IOUSBDeviceUserClient. Depending on what it is doing, this may keep macOS and applications from receiving Apple® Remote button presses. The application is located at /Applications/Google Chrome.app/Contents/MacOS/Google Chrome. At this time, the only solution is to disable the Mac IR Receiver bus and enable it again. Check and Un-Check Disable remote control infrared receiver to re-sync the receiver and Apple remote with your Mac Mini.